Lego just started the buzz, should it be on their Google+ page or on their Facebook. Both of them provides links to their short announcement. So Le Mindstorms ev3 will be available soon. How soon ? From the media release, the ev3 set will be available in the second half 2013. The content will be similar to the NXT 2 box, which means the programable brick, 3 motors and 4 sensors. It seems that there will be a remote control, which wasn’t included in the NXT 2 box. Actually, the sensors will be 2 touch sensors, an improved (compared to the NXT 2.0) color sensor and an infrared beacon. The programable brick have been improved not only in performances, but also with an SD expansion slot, USB, WiFi and Bluetooth. They also say that the brick is compatible with iOs and Android out of the box, but I suppose that this means that Lego’s apps will be available. Of course, you’ll can connect up to 4 other bricks to one programable brick. And yes, the system will be backward-compatible with existing Lego Mindstorms NXT. There are some photos of what will be available in this Flickr gallery. There is no information if it is the content of the box or not, but if it is, there are some inconsistencies with what was published on other sources. First, it is nice to see that the ultrasonic sensor is still there (and believe me, this is a useful sensor). It seems to be only one touch sensor and I can’t identify the one with the two arrows (the IR beacon ? ). There seem to be only two motors as we knew them, even if the third device seem also to be a motor as we can guess from the photo of the crane. Finally, we got a view of the the remote control. From the pictures, we can also see that the motors are bigger (more power ? ), but all the bricks have kept the same pattern. You’ll be able to connect them exactly as the old NXT ones with one difference: the central hole is no more a circular one but a cross shaped one. I think that this will make sensors orientation easier. The set is supposed to come with 560 technic elements and from the photos, lot of gears ! I missed gears in the NXT 2.0 box, so this should be nice. Also, the tracks have been replaced with the modern technic ones. This looks like a great set for all robotics amateurs. But also for all geeks. As the new ev3 programable brick is based on a Linux, we can expect grater hacks of this device. The set will be available on second half 2013 with a price of $350 (USD) or €350. Mindstorms NXT 2.0 are still available either on Amazon.com or Amazon UK . You may want to have a look on their prices but it is uncertain if the price will drop or not. Anyway, as the motors, sensors and of course, technic elements are compatible, you should grab one of those boxes as they are cheaper than the ev3 set. An unexpected gathering, the designer presentation. 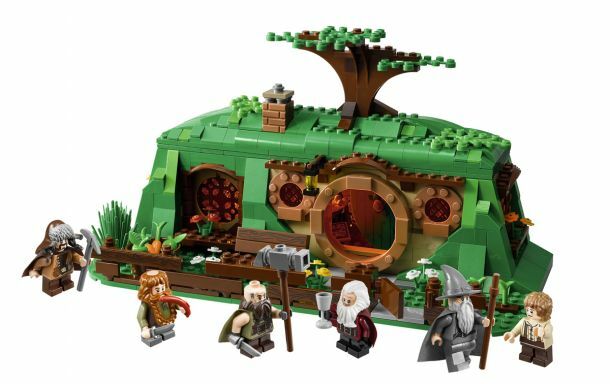 The second wave of the Lord of the Rings Lego sets is now officially known to be about the Hobbit, which movie will soon be released (have you seen the first and second trailer ?). The set available was Bilbo’s house in the Shire. There was no name associated to this photo, today, we know that this set is number 79003 named An Unexpected Gathering. Lego just released a designer’s video showing this product. This is an awesome news for every Batman and Lego fan. As Lego has the License from DC Comics for Batman (and Superman), there was no set including anything from the movies. A lot of fans where awaiting for the Tumbler, which is the Batmobile from Batman Begins. Some really skilled Lego Builders have already built such models. _Tiler flickr page is full of such creations. He does have a really nice Bat, an awesome Bane’s truck and of course, different amazing versions of the Tumbler. There is currently a discount on some Lego products on Amazon UK. The most interesting are on the Alien Conquest collection. 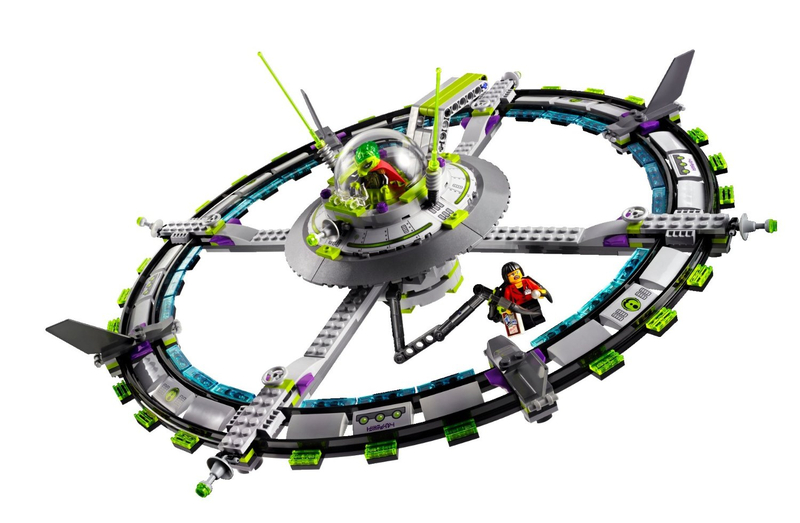 You have the opportunity to get the Alien Mothership (7065) for only £24.99 which is a 50% discount on the regular price ! Less cumbersome but just as fun, the UFO Abduction (7052) does also have an interesting discount at £16.69, and the Tripod Invader (7051) is at £13.49. Alien Conquest is a great collection of Alien abductors invading Earth. The Mothership and the UFO Abduction sets does have light and sound bricks. Those two sets does also have something inspired from Alien’s Facehugger which comes on the head of the civilians minifigures. The Mothership’s Alien Commander would welcome as an awesome addition the Series 8 Alien Villainess . Those are good prices even for neighbor european countries, even with the shipping, the total price will be cheaper. Don’t wait too long for it is unknown how long those prices will last. You can check the badges above which are displaying the current prices. If you got some of those, did your kid have some fun with those or are they dedicated to those grew up with the old Hollywood martians movies ? 9 months ago, we discovered the first trailer of The Hobbit. Today, at last, we can discover 2 minutes and 30 seconds more. With more actions, we can see that we’ll get back to the wise Lord Elrond, the magnificent Lady Galadriel and of course, our lovely creepy Gollum. But that is enough, time to watch the trailer. As you saw, there is no dwarf song this time. You are many to seek informations about the song we heard in the first trailer, hoping to hear the entire song. Unfortunately, you will have to wait a little more. Meanwhile, you can still rediscover the motion picture Trilogy of The Lord of the Rings . Would it help you wait until Bilbo’s adventure ? This is the grand opening of a new section on Là Bas Land: Geek Garage. So, what is Geek Garage ? This is a place for anything geeky that can enter your life. Anything you could get or do. Of course, geek has become a trendy word. Anyone uses it to sell any gadget. Geeks are fond of gadgets of course, but we’ll try to stick on useful gadgets, gadgets that can change your life. This is where the Garage comes in. Awesome projects have stated in garages. Garages are modern labs. Here is your toolbox for your creations. If you are married to a geek and doe not understand why is he/she doing this, this place is also for you. Learn to understand him/her or how to bring him/her in real life activities. No, this is not dangerous for your kids or your family. And yes, I do not consider that geeks are only male. Girls can be geek too. Is this section serious ? Of course it is. Geeks are imaginative people. They intend to find awesome usage from where unexpected. Check the next post, you will see that a little geek touch can event find its place at your work environment. This year, Lego gave the Father’s Day theme. As a Father and son’s day, this is a great opportunity for a geekdaddy to share his gift with his geekid. And what does Lego has to offer ? Simply to share the playing universe in which the father and the son grew up. Before having a peek on some sets, Lego set up a contest on their special web site (EDIT: the link does not exist anymore) for their french audience. It is a contest in which you have to design a spaceship from parts of existing Lego models. You can submit your own until june 17th. And for the occasion, there is a special video featuring the best known father and son from the Galaxy. Yep, from the Star Wars galaxy. Lets begin with an awesome model at a decent price : Gold Leader’s Y Wing. 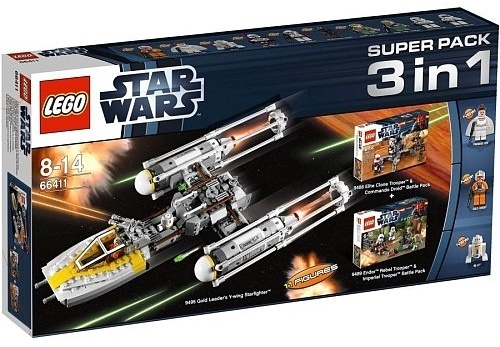 Latest Lego’s interpretation of the Y-Wing, Gold leder’s Y-Wing Starfighter (9495) is an awesome set of 458 bricks. The assembled Y-Wing model measures over 16. 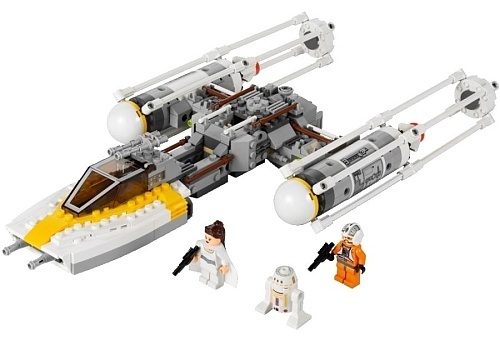 It comes with 3 minifigures: Gold Leader (Dutch Vander), Princess Leïa in ceremonial outfit and astromech droid R5-A7. The starfighter is to be built in 3 steps: the main body, the cockpit and finally the engins. The Y-Wing’s body may be considered as the most difficult part, because of all the little details. The cockpit is much easier. As for the engines, you could build them with your eyes closed. You should plan 1:30 hour to assemble the model. Compared to the earlier versions, the scale is more accurate and the model contains better details. The cockpit canon lost his vertical axis but it has an improved design. The Y-Wing may not be as emblematic as the X-Wing (bombers are never the stars compared to fighters 🙂 ). But it is definitely a must-have to any Star Wars fan. Gold Leader’s Y-Wing also comes in a Superpack. The Superpack box contains the Endor Rebel Trooper & Imperial Trooper Battle Pack (9489) box and the Elite Clone Trooper & Commando Droid Battle Pack (9488) box. The other great universe those days is the Super Heroes. As The Avengers are in our theaters, Lego released 5 sets in the Marvel universe. But the best set is not there, it is in the DC universe. Named Dynamic Duo Funhouse Escape, it is obvious that the box contains Batman and the Jocker. Besides the funhouse, which is full of traps and tricks, the interest of this box is to gather Batman, Robin, the Jocker, Harley Quinn and the Riddler. The content of the box should be easier to assemble than the previous as it contains only 380 parts. 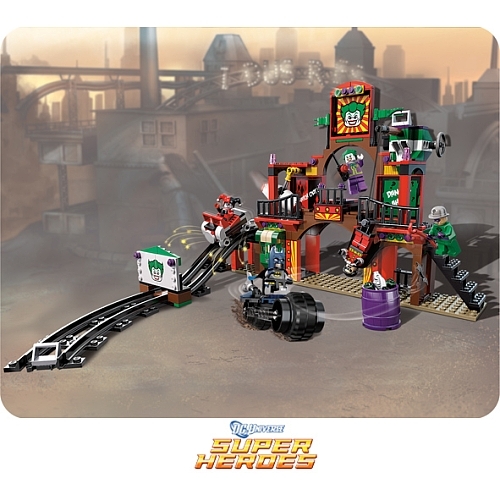 The assembled funhouse features moving floor, opening trap door, hammer, crane and also a wagon rails and the Batcycle. It must be just as fun to build as to play with. It is a great Batman collectible and a great game set. So, what do you plan for Father & son’s day ?